It happened this morning. I noticed it. Blue tones of black, white, and a range of grey. Textured shapes of sky, clouds and evergreen trees softly back-lit by the sun rising below the trees. Fleeting beauty framed by my bedroom window. Engrossed, I just watched. And then, the thinking crept in. I realized that I had not appreciated a predawn sunrise in a long time—a time so long I couldn’t count it in days or weeks. I found myself reflecting how easy it is to miss a beautiful dawn or anything when you thinking about something else. Of course, then it occurred to me that the winter sun rises later, so I miss it because I’m in my kitchen making coffee or catching the weather report. I ‘m glad I caught this particular mid-April predawn splendor. 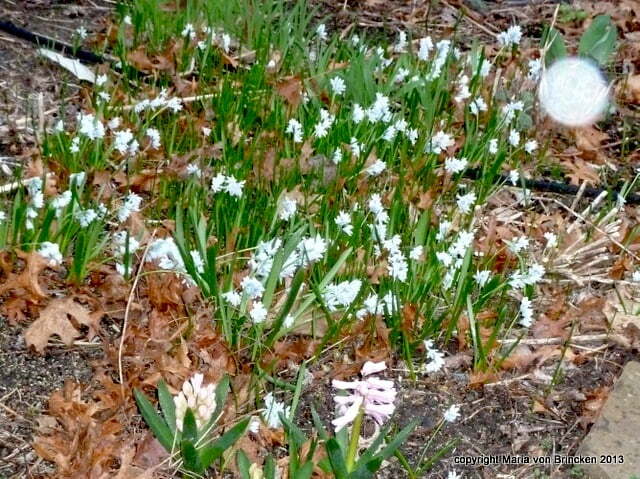 While I might sleep through sunrises, I can’t miss the earliest spring flowering bulbs in my gardens that add much needed color in the bleak early spring landscape. The snow finally melted a week or two ago.The night temps are still below freezing and the days cool with an erratic warm day or two in between. So I haven’t wanted to put the pansies out in the containers. I don’t like the look of frost nipped flowers that take weeks to recover. The early bulbs bloom here and there to greet me from window views or treks to the car. I can hardly miss the intense blue of the scilla. It’s spreading under the budding branches of the weeping Japanese maple (above). Or the pastel blue Puschkinia libanotica colonizing in view of my office window. I marvel that there’s so many of them. I think I planted a dozen tiny bulbs six or seven years ago knowing that they should multiply. But I find it splendid that nothing has eaten them to prevent their increase. A few years back, a gift of three pink potted hyacinths got plunked in the garden, and you can see them emerging with the puschkinia. They don’t look like much from a distance–just a lovely pastel blue wash of color with a spot of pink. The spreading mass of puschkinia pull me outside to take a closer look. That’s when I can see the details of the flowers. I think I’ll dig a clump of the deep blue scilla from elsewhere and add it to the puschkinia. It will make a lovely and dramatic combination for the coming years. I’ve found the pale blue a bit blah and adding the deep blue should fix that. If you want to do that yourself, dig a clump just after they finish blooming. If you wait too long, the foliage will disappear and you won’t know where they are. 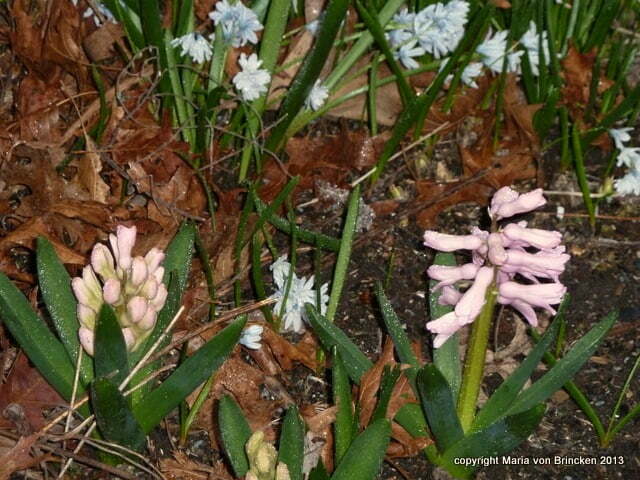 Of course, that’s a lovely feature of these small bulbs – the foliage disappears and the perennials emerge around them. By the way, this area will be filled with the pale blue foliage of the Hosta ‘Krossa Regal’ in about a month. It’s still too cold for even the leaf tips to show. Back to my predawn brain meanderings I found myself thinking about the puschkinia and the sudden loss of them from the 1″ snow storm the other night, I found myself reflecting on their fragility. You can crush them with a footstep or an inch of a late snow. Yet, the buds push themselves up through cold barely thawed ground that freezes nightly. Strong, yet fragile. An apt description of our own bodies and our earth. We gardeners and designers plant early spring flowering bulbs so we get some color before the perennials, shrubs, and trees leaf out and bloom. The bulbs offer the early hope of the rebirth of the landscape and our faith that the winter will end. But they also offer the expectation that the crops will grow and feed us. That expectation hadn’t occurred to me before. I must be tapping into an ancient hope. A hard one to recognize as here in my world I don’t think about it when I buy from our supermarkets stocked with produce both local and worldwide. 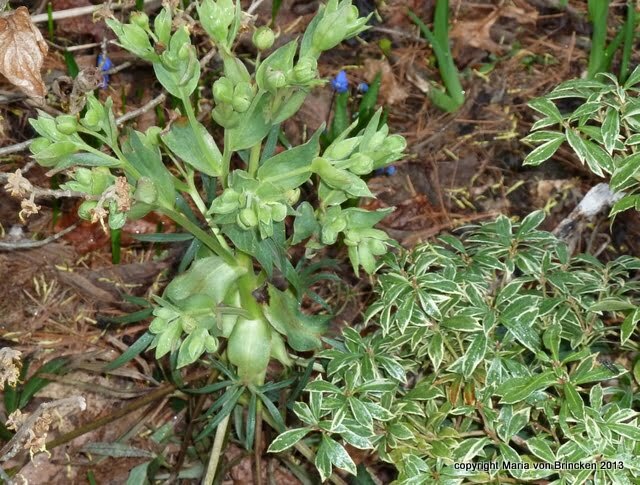 Pulled outside to relish the puschkinia more closely, I found that the perennial hellebores are starting to unfold (above). I love this pink orientalis! 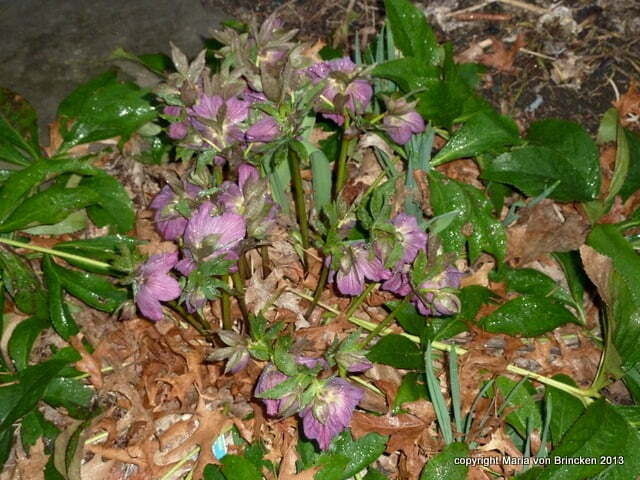 Hellebores are great because their green leaves persist through the winter. I want to add some of the varieties that have upward facing flowers. 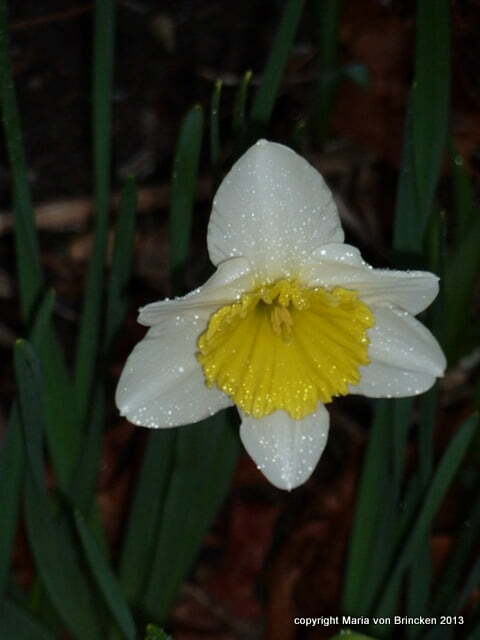 One stray early narcissus flower greets me, the others planted abundantly in my garden are still in bud yet to delight. I plant spring bulbs to bloom in succession and in different parts of the garden. Early tulips and daffodils will continue the spring bulb garden flowers, then the mid and late tulips and dafs, and then the alliums in May and June. 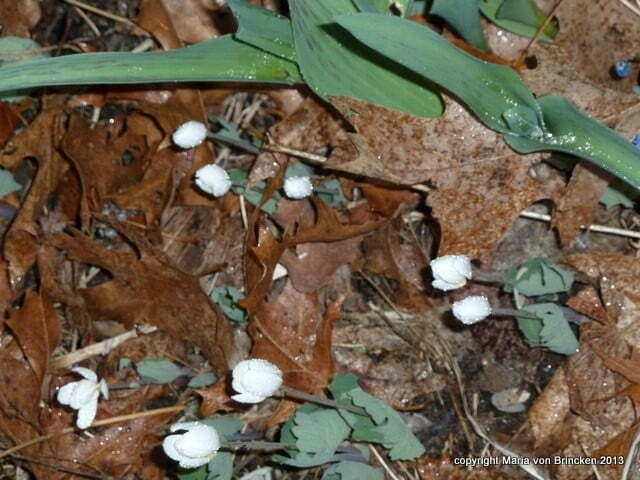 The bloodroot early morning and later when it opens (right). 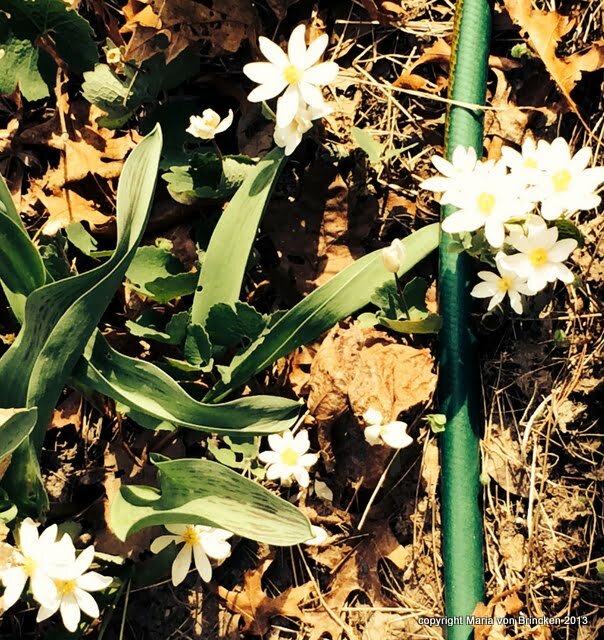 It’s a spring ephemeral that totally disappears after it blooms–foliage and all. The Helleborus foetidus has a totally different flower form and color from the orientalis. It’s greenish and it’s been threatening to bloom for weeks, forming its flowers visually way back in the late fall. I like it paired with the variegated low growing broadleaf evergreen Pieris ‘Little Heath’ with the odd blue scilla here and there. Visiting Tower Hill Botanical Garden this week for a meeting, the rain had started lightly as I snapped the above photo. It was pouring too hard for me to get others later. 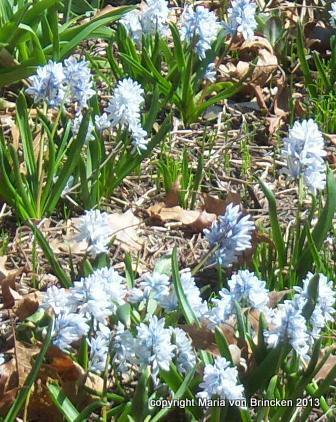 But you get the idea of using the early spring blooming bulbs effectively within the landscape. 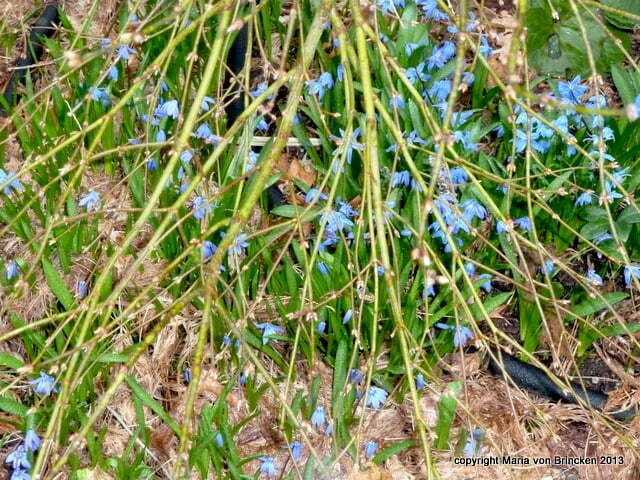 The mass of the deep blue scilla contrast with the reddish shrub stems in the garden above the wall. 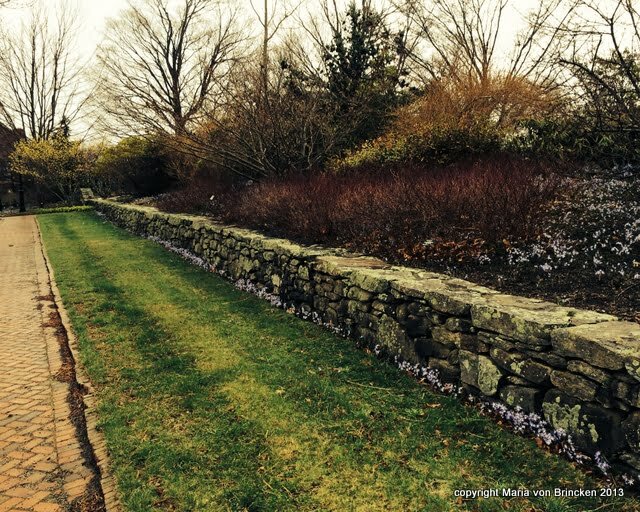 Then the scilla planting at the bass of the wall echoes and repeats the line of the walk. That line leads your eye to the yellow flowering Witch Hazel (Hamamelis, probably ‘Arnold Promise’) in the distance. It’s with gratitude that I celebrate the flowers of early spring and glad I can’t miss seeing them as I scurry about my day. Joyful sigh. Spring has arrived!